Stingray: Any of various rays of the family Dasyatidae, having a whip like tail armed with one or more venomous spines capable of inflicting severe injury. Stingrays exist in shallow waters where they feed on shellfish and crustaceans in the sand and bury themselves to hide from predators. They have a sharp barb on their tail for defense, which flips up and can pierce the skin of the ankle or foot leaving a puncture wound. This is an automatic reflex, which can only happen when they are stepped on. The best way to avoid stepping on a stingray is to shuffle your feet as you walk out through shallow water. This will scare away the stingray from its hiding place. Stingrays are not aggressive; however their sting is extremely painful. Treatment for stingray wounds includes soaking the wound in water as hot as you can stand for ½ to 1 ½ hours or until the pain is gone. Stingray wounds can cause severe allergic reactions in some people. Always report stingray injuries to the lifeguard on duty. Jellyfish: Any of numerous usually free-swimming marine coelenterates of the class Scyphozoa, characteristically having a gelatinous, tentacled, often bell-shaped medusoid stage as the dominant phase of its life cycle. Jellyfish are not really fish; rather, they are invertebrates that float freely in the open ocean with the currents. They have tentacles, which hang from the characteristic “bell” or head of the stingray. These tentacles are primarily used for catching food and have microscopic stinging cells, which shoot invisible harpoon like projectiles into fish and other organisms that swim into its tentacles. Sometimes jellyfish float into the surf zone and are broken apart by the waves. Usually people get stung when fragmented tentacle (which can still sting) brush against swimmers causing a mild rash and some pain and discomfort. In other more tropical oceans of the world, there are jellyfish that can cause severe allergic and neurogenic reactions and even death. In Southern California, jellyfish stings are generally harmless and discomfort and pain usually subsides in ½ hour to forty-five minutes. Seals and Sea Lions: Any of several large-eared seals with relatively long neck and limbs, especially Zalophus californianus, of the northern Pacific. Seals and sea lions are ocean mammals, which are quite common along the Southern California coast. They spend part of their time sunbathing on rocks, beaches, and buoys, where they can sometimes be heard barking. Much of their time is spent in the ocean hunting for fish. They are generally harmless animals but can become aggressive if they or their offspring (pups) are threatened. Sometimes they will crawl up onto the beaches to rest or warm up. Never attempt to approach, feed, or pet a seal or sea lion that has come onto land. If they appear to be injured or ill, contact the lifeguard and the proper authorities will be notified. Shark: Any of numerous chiefly marine carnivorous fishes of the class Chondrichthyes (subclass Elasmobranchii), which are sometimes large and voracious and have a streamlined torpedolike body, five to seven gill openings on each side of the head, a large oil-filled liver, a cartilaginous skeleton, and tough skin covered with small toothlike scales. There are many different types of sharks that exist along our coastline. Most of them are completely harmless to humans and it is almost pointless to list them as hazardous marine life. Most sharks that pose a threat to humans live in the deeper waters off the Southern California coast where there is more food for them to survive on. These sharks are elusive and are rarely sighted by beach goers. The most common sightings are of dolphins. They are quite common along the shoreline and are many times mistaken for sharks because of they have dorsal fins. Dolphins and porpoise can be easily distinguished from sharks by recognizing their up and down motion while swimming and by their curved, more rounded dorsal fins. Sharks swim with a side-to-side motion and have triangular shaped dorsal fins. Sea Urchins: Any of various echinoderms of the class Echinoidea, having a soft body enclosed in a round, symmetrical, calcareous shell covered with long spines. 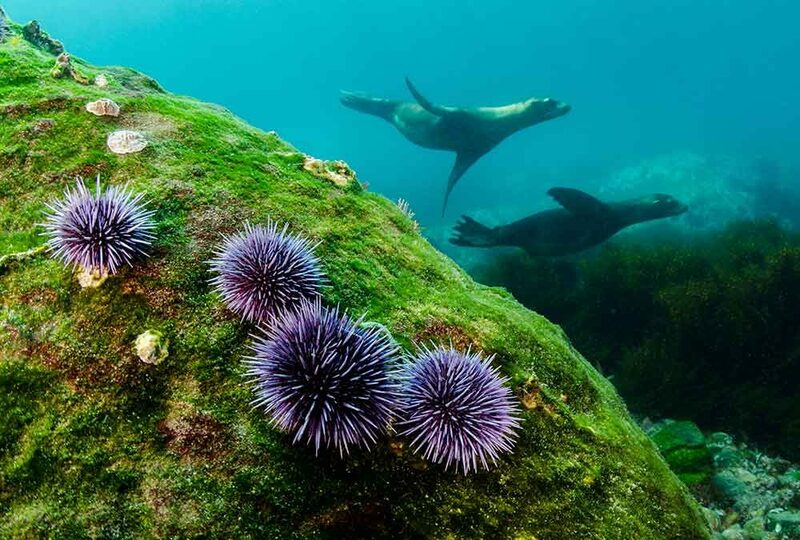 Sea Urchins are spiny relatives of the starfish that dwell in small cracks and crevices of rocks and reefs of the California coastline. They are usually well camouflaged and can be mistakenly stepped on in rocky shorelines. Their spines are not significantly dangerous but can impale the foot quite easily if they are stepped on. It is important to make sure the spine fragments are completely removed from the skin to avoid infection of the wound. At Zuma Beach we occasionally have to worry about Jellyfish, Stingrays, and Sea lions. There has never been recorded shark attack at Zuma Beach.